WESTBROOK — Members of the Westbrook Democratic Committee didn’t bring forth many new names at its caucus last week. In fact, only one of the nomination the Westbrook Democratic Committee made at its caucus Sept. 6 is a political newcomer. The rest were either incumbents or had previous experience. Democrats chose Mike Foley to challenge local business owner and Discover Downtown Westbrook President Deb Shangraw to run for the At-Large City Council seat held by John O’Hara, Isabel Mullin to challege incumbent Gary Rairdon for the Ward 4 seat on the council. Anna Turcotte was nominated by the party to run to retain her Ward 3 seat on the City Council. At their caucus last week, Republicans did not bring a name forward for the Ward 3 and Ward 4 seats. Suzanne Salisbury was chosen to run for the at-large school committee seat held by Odilia Harmon and Steve Berry to retain his Ward 1 school committee seat. The party brought forth incumbent Veronica Bates, who will be challenged by Republican Kristen Beahm, the assistant director of academic assessment at the University of Southern Maine, for the Ward 2 seat and chose incumbent Jim Violette over Beth Schultz for the Ward 5 school committee nomination. O’Hara, a Republican and the council’s longest serving member, has 20 years of council experience, but chose not to run again. Foley also has extensive council experience, having been elected in 2006 as a high school senior. He served in the position until 2016 when he stepped down in order to spend more time with his young family. After sitting out two years, he is ready to get back behind the council dais again. “Now it’s time to come back and serve the city again. I really enjoyed ny service to the community ahd hope the community will have me back,” Foley said. Turcotte, on the council since 2015, said she wants to continue on the council as a way to give back to her community. Rairdon, a councilor since 2013, welcomes the challenge from Mullin, but would like to stay on the council to continue his look into controlling taxes – his top priority – and increasing economic development. “I look forward to serving not only the people in Ward 4, but also from across the city with any issues they may have,” Rairdon said. Schultz, a former administrator in the Gray-New Gloucester, Bonny Eagle and Biddeford school systems and an instructor at Southern Maine Community College, told voters from Ward 5 “even though this is my first go at political office, I am not new to education or the policy or procedures of school boards.” She said she understand the “crucial role” school boards play in educating a community’s youth. In the end, Ward 5 democrats opted for Violette, who has served on the school committee since 2010 and before that had a long stint on the City Council, as well as playing roles in several other city and community committees. Despite not winning the Democratic nod, Schultz has taken out nomination papers and has been verified as a candidate for the Ward 5 school committee seat. Bates, first elected to the School Committee in 2011, told the American Journal last month she is seeking another term to see through initiatives that are already underway. “There are still a couple projects that are in the works, such as the school expansion (at Saccarappa). I want to see that finished and be able to walk through and marvel how it went from paper to reality. I also know there are some things at the state and federal level and I want to be able to work on those to make sure they impact Westbrook positively,” Bates said. Republicans did not nominate a candidate to run against Salisbury, who served on the school committee from 2007 until 2017 when Harmon was appointed to fill the remainder of Salisbury’s term. Aside from nominating candidates for the open council and school board seats, city Democrats also chosen party leaders for the next two years. David Morse was chosen to continue as party chairman, while Mullin was chosen to be vice chairman. Former vice chairman Dan Neuville was tapped to take over secretary duties from Colleen Hilton. Foley was chosen to continue in his capacity as treasurer. While Bates, Beahm, Berry, Foley, Mullin, Salisbury, Shangraw, Turcotte and Violette have been chosen by their poitical parties to run for the expiring council and school committee seats, their politcal party will not be listed on the ballot. Per the city charter, “no political party designation shall be included on the ballot for any municipal office.” Voters decided in 2012 to remove political party from the ballot for municipal office races. 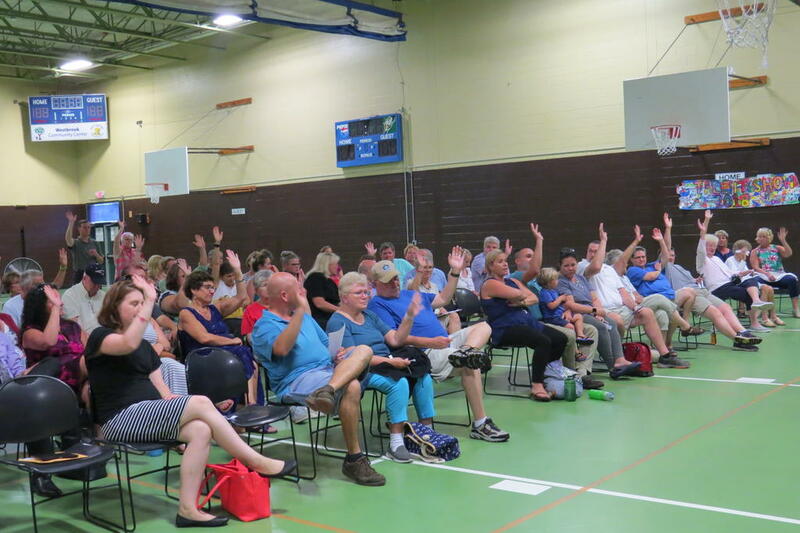 City Democrats vote at their caucus Sept. 6 to nominate Suzanne Salisbury as a candidate for the at-large School Committee seat, a position she held from 2007 to 2017. 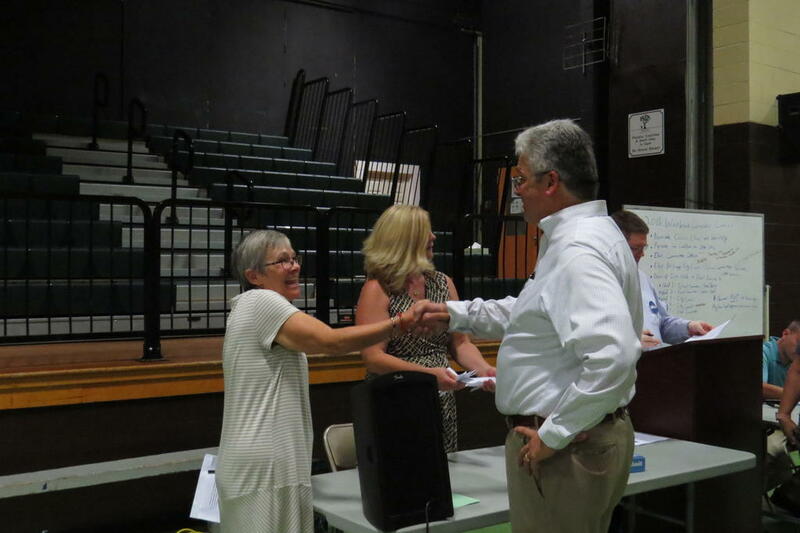 Westbrook Democratic Committee Chairman David Morse announces the caucus results Sept. 6 as Mike Foley, a candidate for the expiring at-large City Council seat, and former Mayor and Democratic Committee Secretary Colleen Hilton fill out paperwork. Beth Schultz congratulates Jim Violette on winning the nomination to retain his Ward 5 School Cmmittee seat at the Democratic caucus last week.